After reviewing the new paradigms in AX 7, it's time to put these paradigms to practice and review the current and future state of the Dynamics AX application code. To recap, a package corresponds to its own mini-modelstore, with its own layers and models. Each package roughly translates to a .NET assembly, meaning it's a unit of compilation. It also means one cannot over-layer from one package to another. Packages can "reference" each other, exactly like other .NET assemblies can reference each other. This is needed so one package can use features of another. This concept is being put to use in the standard application code, and the ongoing effort to accomplish this split-up is commonly referred to as the "package split". Initially, the package split can be thought of in three main areas: the platform, the foundation, and the application. The platform is all the essential AX platform pieces that are not in the kernel but in X++, yet they are essential to the AX platform. Things like the users tables and the form to create and maintain those users. The foundation contains basic features that most of the application code will depend on. Things like the number sequence functionality. Finally, the application itself, which is all the business logic. Although you can think of those big three, the "application suite" as the package is called is slowly being split up further. You'll see packages like "general ledger" and "dimensions" that have been split off from the application suite. In a sense they sit in between the foundation and the application suite, because they are application logic but they are shared between different modules and functionalities. 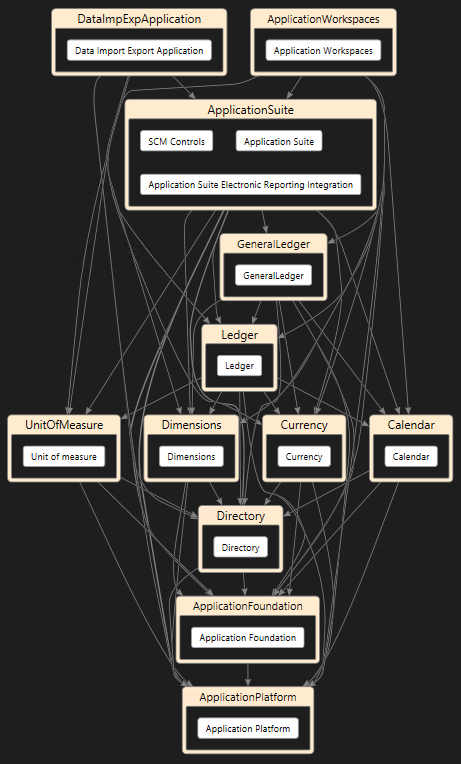 Below a "simplified" view of the standard package hierarchy in AX7. Some packages were left out to show the idea. Since packages "reference" each other like normal .NET assemblies, the references are not transitive and usually the package at a "higher" layer needs to reference some of the lower layer packages as well. But clearly, everything references platform, some reference foundation, and it goes up from there.